Our Kids in the City research project has involved 253 children aged 9-12 years and their parents/caregivers; a team of researchers from Massey University, AUT University and the University of Auckland; and nine young local people trained as interviewers. The children came from six suburban and three inner-city schools in neighbourhoods with varying urban design characteristics in terms of housing density, street connectivity and walkable access to a range of community destinations such as libraries, shops and parks. The overarching goal has been to provide an evidence base to ensure children’s wellbeing is taken into account in urban policy and planning decisions, particularly within the context of urban intensification. Specific research aims were to assess children’s levels of physical activity and independent mobility (unsupervised play and travel) and to find out about their neighbourhood experiences and perceptions. What features of children’s neighbourhoods might affect these? Concerns about decreasing levels of physical activity and independent mobility, coupled with rising obesity rates amongst New Zealand children, were catalysts for the research. Physical activity and independent mobility are important both for children’s everyday wellbeing and their longer term development – cognitive, social and emotional as well as physical. The suburban component of the research (funded by the Health Research Council, 2010-2013) looked at children’s mobility and physical activity in six suburban neighbourhoods and children’s and parents’ neighbourhood perceptions. The inner city component, which began a year later (funded by the Marsden Fund, 2011-2014) also explored margins for change in safety discourses which limit children’s everyday independent mobility and physical activity. The data were collected in 2011 from children at suburban schools and 2012 from children at inner-city schools. Kids in the City used a mixed methods approach combining a cross-sectional multi-level (child/family/school/neighbourhood) design to investigate associations between neighbourhood environmental attributes and children’s independent mobility and physical activity. ‘Go along’ neighbourhood walking interviews with children and focus group discussions with parents explored neighbourhood perceptions and experiences. Recognizing the potential influence of walkability (an index including measures of street connectivity, dwelling density, land use mix and retail floor ratio) and access to services and amenities (an index of walking access to child-appropriate destinations), suburban schools with similar decile ratings (an indicator of socio-economic status of a school’s catchment area) and differing neighbourhood walkability and neighbourhood access scores were paired. Preliminary classroom-based sessions were conducted to engage the children in the study and introduce them to the equipment. Parents were invited to information sessions at each school to have the study process explained to them in more detail. All child participants wore an accelerometer (to measure physical activity) and a GPS unit (to track where they went) over one week during waking hours. They also recorded in trip diaries where they went, how they travelled (walk, bike, car etc. ), and who they travelled with. Researchers visited children at their schools for six consecutive weekdays to collect the GPS, accelerometer and trip diary data and recharge the GPS units. One hundred of the 160 suburban children participating and 40 of the 93 inner-city children later took trained local high school student interviewers and/or researchers on ‘go-along’ neighbourhood walking interviews which prioritised the children as active agents in the research process. Children talked about where they went, what they liked and disliked, and their safety concerns. The data were transcribed and analyzed thematically in NVivo using a systematic inductive process. In the inner-city component of Kids in the City, school-based discussion groups were also held with five groups of children across the three schools. Parents of all participating children completed a computer-assisted telephone interview (CATI) which detailed child, parent, and household demographics, parental perceptions of the importance of their child’s independent mobility and parents’ neighbourhood perceptions. Subsequent focus groups (15 groups across the nine schools) also centred on parental perceptions and experiences of neighbourhood, along with the factors that influenced their decisions on when and where their children could play and travel, alone and accompanied. While there were large variations in the neighbourhood experiences of individual children (some were not allowed outside their front gate/apartment foyer without adult supervision, while others were often independently out and about), and some differences according to neighbourhood type, the overall findings show children had quite restricted independent mobility and limited interaction with their neighbourhood environments outside of home and school. School was the most frequent destination for all children, followed by retail outlets/shopping centres and sporting venues. 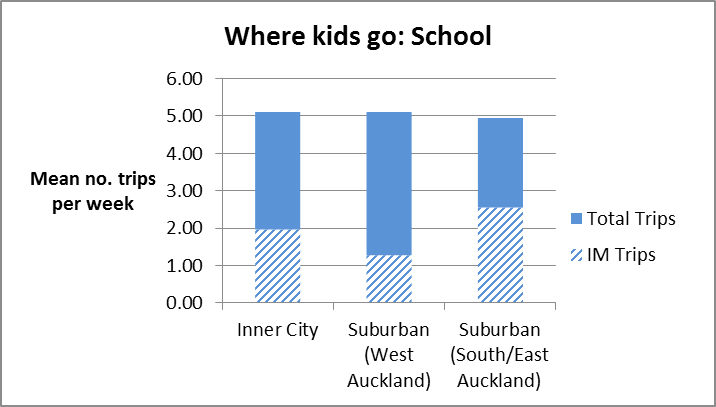 For both inner-city and suburban children, more than a third of the trips they reported making (almost 38%) were to and from school, with significant differences in levels of independent mobility between West and South East suburban children (see below). 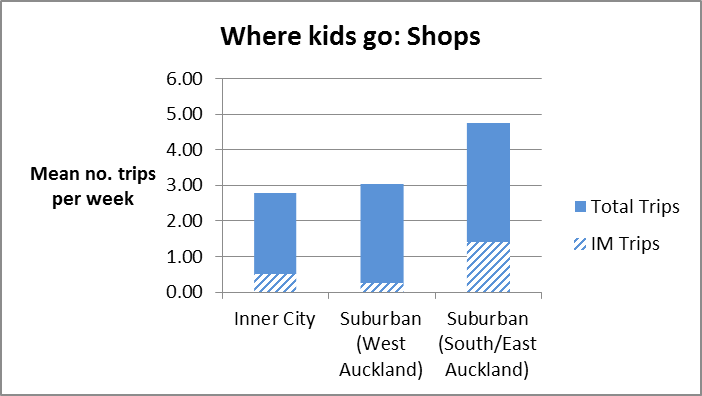 Suburban children made twice as many trips to the shops as inner-city children — with once again differences between the West and South/East suburban children (see table below). Conversely, inner-city children made four times as many sports-related trips as suburban children in the South and East and twice as many as the suburban children attending schools in the West. Very few of these trips were made independently. 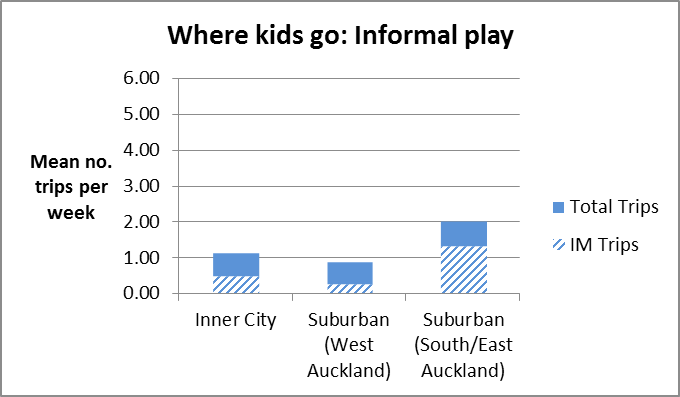 Of other more frequent destinations, trips made by South and East Auckland suburban children (but not those from West Auckland) were more likely to be to the park and other informal play destinations. More than half of these trips were also made independently by South and East suburban children (see table below). Friends’ homes and local dairies/convenience stores were the only destinations where more than half the trips made by children were independent (60% and 56% respectively). In terms of other destinations, only 41% of school trips, 23% of shopping trips and 8% of trips to formal sporting activities were made independently. Findings from the interviews and discussion groups clearly show that children’s and parents’ fears were the main factors limiting children’s independent mobility — and ‘stranger danger’ and traffic were the primary fears. Both parents’ fears for their children’s safety and their children’s own fears meant many children seldom ventured beyond the confines of home, school and the houses of friends and family. Parents’ suggestions of measures which could make their neighbourhoods better for children addressed their two main safety concerns: the dangers of traffic and stranger danger. In terms of traffic, suggestions included lower speed limits; extending the present 40kms around schools out to a 2 km radius for one hour before and one hour after school; more pedestrian crossings; bike lanes; and wider pavements (which could be shared by pedestrians, scooter-riders and cyclists). In terms of children being safe from violence and bullying, suggestions included getting to know neighbours; more community responsibility for children’s safety; greater police presence and security on the streets; better lighting and safer parks. Accelerometer data (see table below) confirmed that outside of school hours children were engaged in sedentary activities far more often than they were physically active. High levels of sedentary time were consistently observed, with children spending an average of 6.8 sedentary hours per day (ranging from 6.3 to 7.8 hours). However almost all (96%) of the children accumulated a daily average of at least 60 minutes of moderate-to-vigorous physical activity every day – the minimum recommended for good health. The table below shows the average daily percentages of time spent at each activity level for all participating schools (East,1 & 3; South, 2 & 6; West, 4 & 5; and inner city, 7, 8 & 9). Overall, activity patterns were relatively similar across schools, with children spending between 56-67% of the time they wore the accelerometers being sedentary, and only 13-18% of their time in moderate-to-vigorous activity. Combining and analysing GPS data sets presents a picture of how active children were and where, over the week (excluding week-day lunchtimes when equipment was being recharged and data downloaded; and night times when accelerometers and GPS units were removed for sleeping). Preliminary results are presented below. Table 1. Cumulative percentage of time and Moderate-Vigorous physical activity (MVPA) spent at distances from home. The first distance (400 m) includes home. Table 1, above, shows that, even excluding night times and week-day lunchtimes, children spent almost half (46.5%) of their time within 400 metres of their homes (including at home) – and only 13% of their time more than 3000 metres from home. Similarly, most of their moderate to vigorous physical activity occurred within 400 metres of home (including home). Table 2, below, shows children were mostly sedentary, regardless of location, and more likely to be physically active at school and other locations than at home. Table 2. 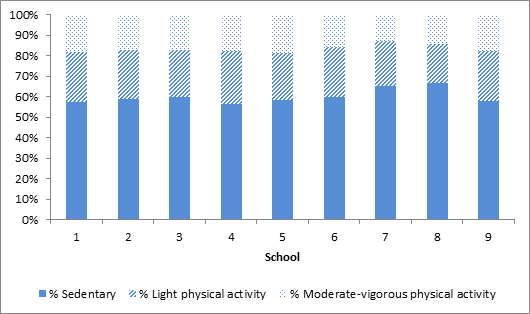 Percentage time spent in different locations by physical activity (PA) intensity for all children with GPS/accelerometer data. In earlier research the team have developed indices to measure neighbourhood access to amenities and services (eg parks, libraries, shops, schools, bus stops). The indices have not been tailored to the types of destinations used by specific population groups. The detailed trip diary information collected on the destinations children go to and the frequency of trips to these destinations, is enabling the development of child-specific measure of a Neighbourhood Destination Accessibility (NDAI-Child) to be used to model associations between amenity access and children’s independent mobility and physical activity. Oliver M, Parker K, Witten K, Mavoa S, Badland H, Chaudhury M, Kearns R (in press) Children’s out of school, independent mobility, active travel and physical activity: a cross-sectional examination from the Kids in the City Study, Journal of Physical Activity and Health. Witten, K., & Carroll, P. (2015, forthcoming). Children’s neighbourhoods: places of play or spaces of fear? In K. Nairn & P. Kraftl (Eds. ), Space, Landscape, and Environment, in Volume 3 of Skelton, T. (editor-in-chief), Geographies of Children and Young People. Springer. Carroll, P., Witten, K., & Kearns, R. (2015, forthcoming). Kids in the City: everyday life in inner-city Auckland. In C. Freeman & P. Tranter (Eds. ), Space, Landscape, and Environment, in Volume 12 of Skelton, T. (editor-in-chief), Geographies of Children and Young People. Springer. Badland, H., Kearns, R., Carroll, P., Oliver, M., Mavoa, S., Donovan, P., Parker, K., Chaudhury, M., Lin, J., & Witten, K. (2015). Development of a systems model to visualise the complexity of children’s independent mobility. Children’s Geographies, Published online: 16 Mar 2015, doi:10.1080/14733285.14732015.11021240. Badland, H., Donovan, P., Mavoa, S., Oliver, M., Chaudhury, M., & Witten, K. (2015). Assessing neighbourhood destination access for children: Development of the NDAI-C audit tool. Environment and Planning B: Planning and Design, 42, doi:10.1068/b140009p. Kearns, R., Carroll, P., Asiasiga, L., & Witten, K. (2015, forthcoming). The variegated nature of play for Auckland children: banal landscapes and the promotion of wellbeing. In J. Horton & B. Evans (Eds. ), Play, Recreation, Health and Well Being, in Volume ? of Skelton, T. (editor-in-chief), Geographies of Children and Young People: Springer. Witten, K., Kearns, R., & Carroll, P. (2015). Urban inclusion as wellbeing; exploring children’s accounts of confronting diversity on inner city streets. Social Science and Medicine, Available online 14 January, doi: 10.1016/j.socscimed.2015.01.016. Oliver, M., Mavoa, S., Badland, H., Carroll, P., Asiasiga, L., Tavae, N., Kearns, R., & Witten, K. (2014). What constitutes a trip? Examining child journey attributes using GPS and self-report. Children’s Geographies, 12(2), 249-256. Witten, K., Kearns, R., Carroll, P., Asiasiga, L., & Tava’e Fa’avale, N. (2014). New Zealand parents’ understandings of the intergenerational decline in children’s independent outdoor activity. In M. Roche, J. Mansvelt, R. Prince & A. Gallagher (Eds. ), Engaging Geographies: Landscapes, Lifecourses and Mobilities (pp. 155-174). Newcastle upon Tyne: Cambridge Scholars Publishing. Carroll, P., Asiasiga, L., Tav’ae, N., & Witten, K. (2013). 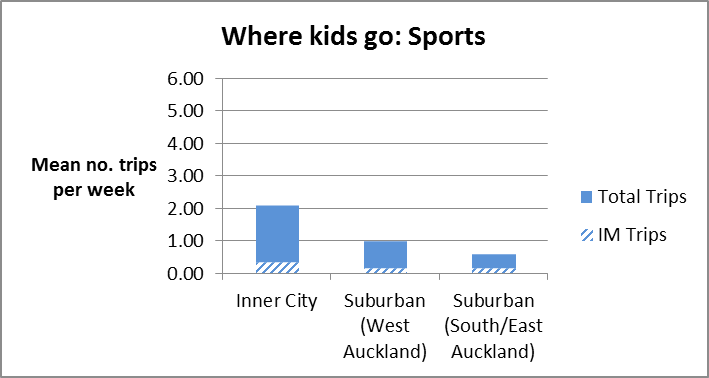 Kids in the City: Differing Perceptions of One Neighbourhood in Aotearoa / New Zealand. In R. Coles & Z. Millman (Eds. ), Landscape, Wellbeing and Environment (pp. 129-146). London: Routledge. Witten, K., Kearns, R., Carroll, P., Asiasiga, L. & Tava’e, N. (2013) New Zealand parents’ understandings of the intergenerational decline in children’s independent outdoor play and active travel. Children’s Geographies, 11(2), 215-229. Oliver, M., Witten, K., Kearns, R. A., Mavoa, S., Badland, H. M., Carroll, P, Drumheller C, Tavae N, Asiasiga L, Jelley S, Kaiwai H, Opit S, Lin EY, Sweetsur P, Moewaka Barnes H, Mason N, Ergler C. (2011). Kids in the city study: research design and methodology. BMC Public Health, 11, 587. Mavoa, S., Oliver, M., Witten, K., & Badland, H. (2011). Linking GPS and travel diary data using sequence alignment in a study of children’s independent mobility. International Journal of Health Geographics, 10(64), http://www.ij-healthgeographics.com/content/10/11/64.